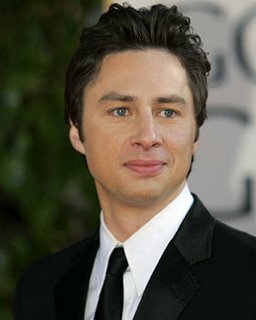 Screen and stage actor, writer, and director Zach Braff will host the Huntington Theatre Company’s 2011 Spotlight Spectacular! gala benefit on Monday, May 9, at the Westin Boston Waterfront Hotel. The event will honor Boston playwright Lydia R. Diamond and Trustee Bill McQuillan with The Wimberly Award, the Huntington’s highest honor. Proceeds from Spotlight Spectacular! support the Huntington’s programs, including its award-winning Youth, Education, and Community initiatives such as the Student Matinee Series (serving 8,000 students annually), the Huntington-Codman Academy Charter Public School Partnership, and Poetry Out Loud (serving a record 18,000+ students from over 70 schools this year). Braff and Huntington Artistic Director Peter DuBois first collaborated in the summer of 2010 when Braff starred in the world premiere production of "Trust," directed by DuBois, at Second Stage in New York. DuBois will direct Braff’s play "All New People" at Second Stage this summer. Zach Braff’s feature film writing and directorial debut, "Garden State," premiered at the 2004 Sundance Film Festival and earned him a coveted WGA nomination for Best Original Screenplay. The film also earned him an Independent Spirit Award for Best First Feature as well as a nomination for Best First Screenplay. In addition, Braff was awarded Best Directorial Debut by the National Board of Review, Breakthrough Director by the Hollywood Film Festival, and Most Promising Filmmaker by the Chicago Film Critics Association. Braff can be seen this spring in the Tribeca film, "High Cost Of Living," for director Deborah Chow. He was nominated for a 2005 Primetime Emmy Award and for 2005, 2006 and 2007 Golden Globe Awards for his portrayal of Dr. John "J.D." Dorian in the NBC comedy “Scrubs.” His film credits include roles in "The Broken Hearts Club," "Getting To Know You," "Manhattan Murder Mystery," "The Last Kiss," and "The Ex." His stage experience includes roles in The Public Theater productions of "Twelfth Night" and "Macbeth" directed by George C. Wolfe. Lydia R. Diamond is a Huntington Playwriting Fellow alumna and the author of the Huntington’s hit production of "Stick Fly." Her other Boston productions include "Harriet Jacobs" at Central Square Theatre, and "Voyeurs de Venus" and "The Bluest Eye" at Company One. Her work has been produced at many theaters around the country including Hartford Stage, Long Wharf Theatre, Arena Stage, Goodman Theatre, Steppenwolf Theatre Company, and True Colors Theatre Company. She serves on the faculty at Boston University. Bill McQuillan is the immediate past President of the Huntington Board of Trustees, of which he has been a member since 1998. Bill served with distinction as Vice-Chair of the Setting the Stage Campaign and was a driving force behind the creation of the Stanford Calderwood Pavilion at the Boston Center for the Arts, as well as the Huntington’s first-ever institutional endowment. He is the president of Boylston Properties, a real estate development firm in Boston. Chaired by Huntington Overseers Bryan Rafanelli and Fancy Zilberfarb, the 2011 Spotlight Spectacular! will feature a cocktail reception, a silent auction, a seated dinner, live auction, entertainment, and dancing. An online auction at huntingtontheatre.org/auction will allow Huntington patrons and friends to bid on items prior to the event. Online, silent, and live auction items available last year included tickets to a Ringo Starr concert, a walk-on role in the film "What’s Your Number," a “Come as your Favorite President” cocktail party with Trustees Doris Kearns Goodwin (Team of Rivals) and Richard N. Goodwin ("Two Men of Florence"), a Tony Awards package, and much more. The gala will also offer an opportunity for guests to “Sponsor-a-Class” in support of the Huntington’s Student Matinee Series. Spotlight Spectacular! sold out in 2010, raising $625,000. This year’s table prices range from $7,500 to $25,000 with individual tickets available from $500 to 2,500. For more information about the event, to sponsor a table, or to purchase tickets, contact Shaine Belli at 617 273-1536 or SBelli@huntingtontheatre.bu.edu.